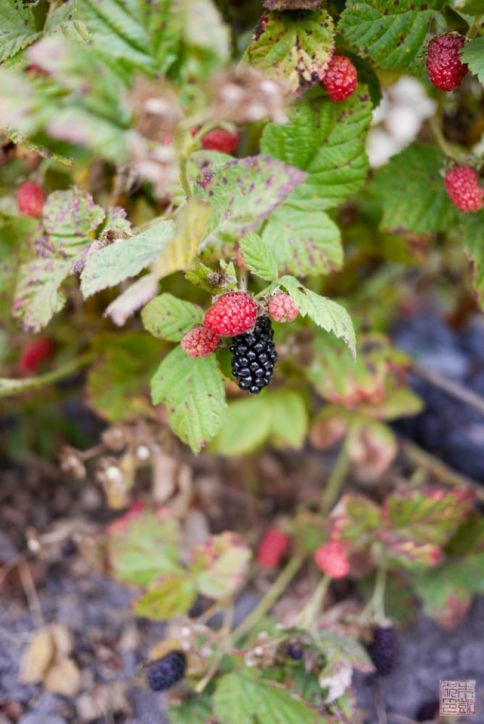 Last weekend we decided to take a trip down to our favorite berry u-pick farm and find out. Unlike other years where it was brilliantly sunny, this year found us driving down through a chilly fog. The weather didn’t matter though, as long as there were rows and rows of berry-laden bushes waiting for us! The bright, raspberry-red berries aren’t ready for picking yet; you want the purply wine-dark ones. Last year we went a little too early and the ripe ones were far and few in between, and not as sweet as we’d hoped. This year our timing was better and we filled our little wagon easily with ripe berries. 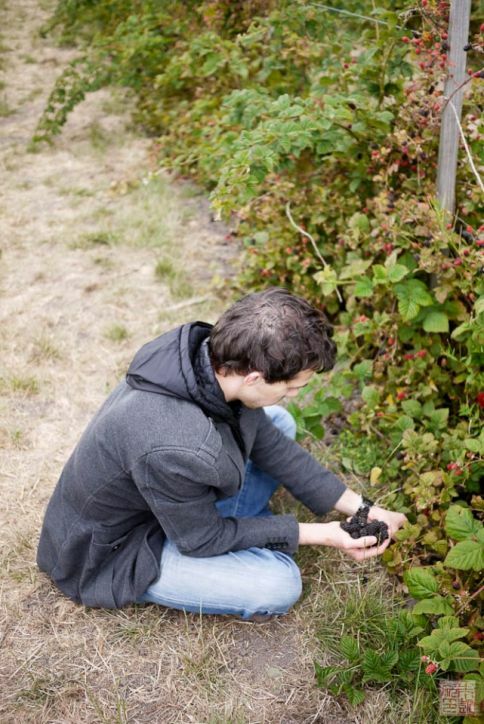 Mike, expert berry picker. The ripest berries are usually found low to the ground, under leafy shade. You might walk by a bush that looks covered in red unripe specimens, then bend down and find a whole trove of berries hiding under the leaves, waiting to be picked. If you saw my other olallieberry post, I’ve made quite a few things with these guys (the ones that didn’t get eaten up, that is). They can pretty much be used in any berry recipe you have as well. This time, I had the idea for shortcake (probably because Mike has been having biscuit cravings lately…and shortcake is a form of biscuit!) 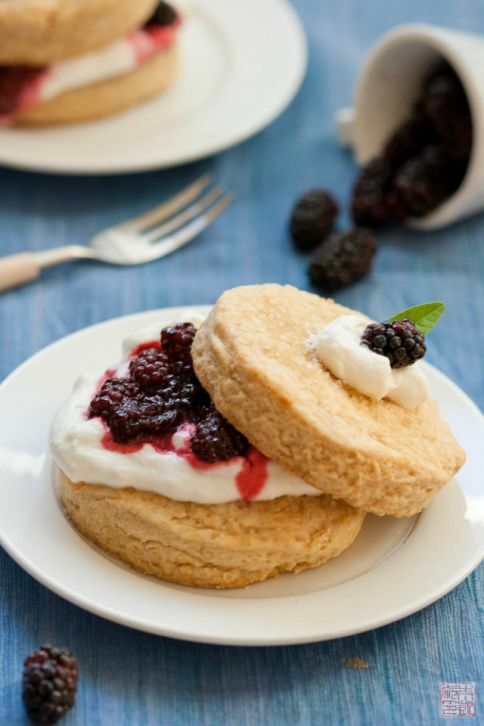 So, brown sugar shortcakes with lemon verbena cream and olallieberries? I thought it would be funny to stick a lemon verbena leaf on top of the shortcake because sticking random greenery on dessert is so wrong and outdated right? But it’s actually ok here since there is lemon verbena in the dessert. I pretty much want to infuse everything with lemon verbena right now because our lemon verbena plant is growing like crazy, and I can’t get enough of the scent. It adds a lovely freshness to the whole dessert, and it provide a nice base for the olallieberries. I cooked the berries with a little sugar, just long enough for them to soften and sweeten a bit, which I think helps them mesh with rest of the dessert better than if they were just raw, but also lets you fully enjoy their berry-ness without them being buried under all the other flavors. As for the shortcake biscuits, they were light and fluffy and hopefully what Mike was hankering for – I think so because he did clean his plate! Combine cream and lemon verbena leaves in a small saucepan. Bring cream to a boil. Take off heat and cover saucepan, and let steep for an hour. Strain cream and chill for an hour in refrigerator. Combine flour, brown sugar, baking powder, and salt in a food processor. Add butter and pulse just until it turns into coarse meal. Add cream and pulse just until the dough starts to clump together - do not let it combine into one solid ball. Turn out dough onto a piece of plastic wrap and form into a square about 1 inch thick. Chill in refrigerator for 15 minutes. Take out dough and using a 3-inch biscuit cutter, cut out 8 round biscuits. Place on baking sheet about 2 inches apart. Brush tops lightly with cream and sprinkle with turbinado sugar. Bake for about 20 minutes until biscuits are golden brown. Let cool on wire rack. Combine berries, sugar, and lemon juice in a medium saucepan. Cook for 3-5 minutes over medium heat until the sugar has melted and the berries are beginning to soften. Let cool. 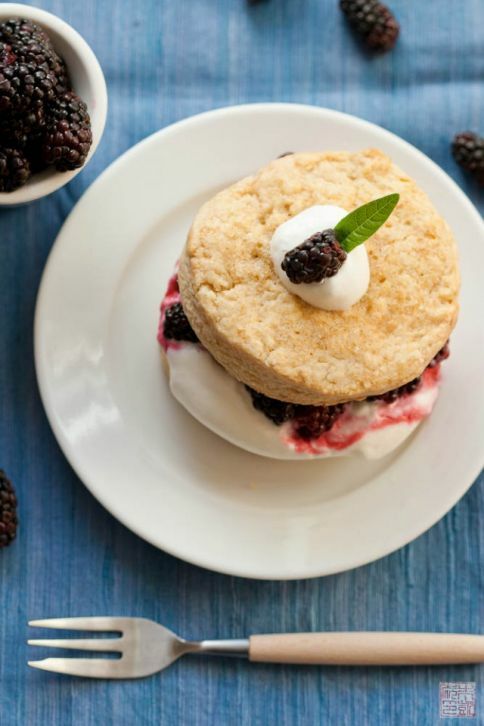 Place shortcakes on plates. Whip the lemon verbena-infused cream in stand mixer to soft peaks. Spoon over the shortcakes. Spoon some of the olallieberries over the cream. Serve immediately. I have never heard of those before, they sound really good. This is such a great way to utilize summer berries! Looks delicious! Such a pretty dessert! And I love the name olallieberries too! So fun! I confess to just saying ‘olallieberries’ over and over for the sheer enjoyment of it. 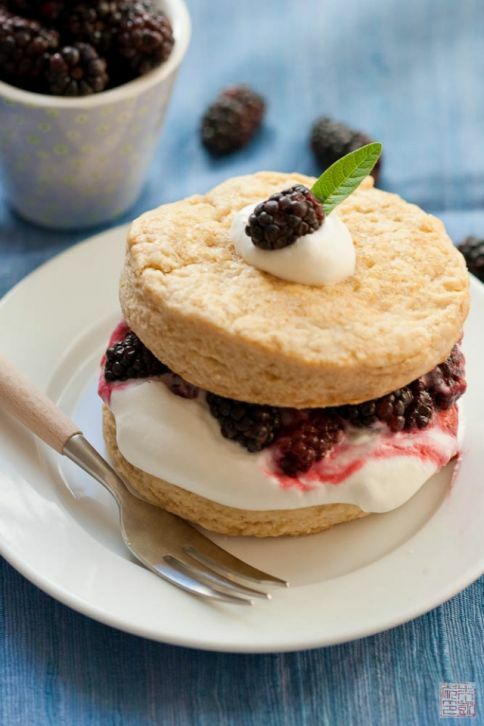 These shortcakes look so wonderful!! I’ve never heard of olallieberries, but they look just like a bush that grows in my backyard, and I’m wondering if they’re growing there?!? Sounds the same – the berries go from bright red, which are gorgeous but completely inedible – to deep blackish/purple. Do you know if they grow in Illinois? This is something very different i have came through! Olallieberries are lovely!Just gone through the recipe,simple directions to follow ..looks so good to serve.